If you would like to start a new Knit for Peace group, then please get in touch and we’ll be able to give you advice and help (our details are on the ‘Contact Us‘ page). Being part of a group means that you can pool resources when sending in your donations. Be sure to fill in the Knitted Goods Recording Sheet and tell us the name of your group, and send us some images so that we can shout about it. 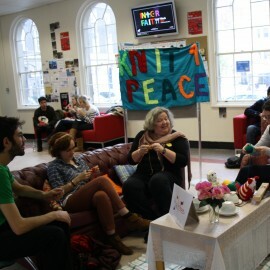 We currently receive knitting from over 1,000 groups in the UK, in schools, universities, community groups and prisons. We even have groups abroad, in America and France. You do not have to be a member of a Knit for Peace group to send us knitting. We are here to promote knitting and make it easy. If you’re looking to join a knitting group in your local area UK Hand Knitting Association has a great tool to find groups in your region. Click HERE to find out more!